Checking the size and shape of the "Meteorites"
1. Fill the shallow dish or plastic tub with the flour provided in the bag. 2. Pick the smallest pebble and standing on the chair, gently drop your pebble into the flour. 3. Observe. Now take a larger pebble and predict how big the crater will appear, when you drop it in the flour from the same height. 5. Repeat Step 3 again, but with a medium-sized pebble. Notice any difference? 6. Repeat Step 3 again, but with the largest rock. What do you observe? 8. 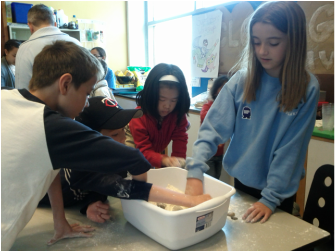 Now smooth out the flour in the dish, and repeat the whole process again (with the smallest, medium and largest pebbles/rocks), but varying the height, force, and angle of your "Meteorite." What happens? All the craters scientists have seen on the Moon and the Earth are circular. This is because when an explosion occurs when there is an impact, and forces that are associated with an explosion are always symmetrically spherical. Interesting to note: even some of the not-so-round pebbles leave behind almost spherical Craters!